When you want to get a job done, you often need more than just one tool and they have to be the right tools that work together. The same is true of marketing. One marketing tool may not be enough to get the results you want. Spaghetti without meatballs and sauce leaves a lot to be desired. On its own, email is not an effective tool for generating trust and engagement from your target audience, because it must compete with hundreds of other incoming messages. It’s also easy for your audience to delete your messages without even opening them. In contrast, direct mail is an excellent tool for creating engagement and building trust. Its “open rate” is several times higher than email, and it can be used to drive prospects to a landing page online, via a shortened URL or a QR code. There, you can capture their name and email address in exchange for an ebook, white paper or other high-value informational content. Combining direct mail with email in an integrated campaign leverages the strengths of both media types: A postcard or other mailer leads off the campaign, creating brand visibility and memorability. Follow that with a series of emails designed to nurture your prospects toward a sale. These messages should have a higher than normal open rate, because your audience will remember your brand from the direct mail piece. Cultivate, our company’s digital agency, has used this hybrid marketing technique with great success to identify and nurture prospective clients. Build your list: Direct mail lets you solicit new customers with an enticing offer. That offer leads them to your website, where they can provide you with personal data in exchange for the enticing tidbit you’ve promised. That’s how you build a valuable email list. Uncover new prospects: In addition to your “house” list, you can purchase customized mail lists that target your ideal customer: You can compile a mailing list with the same qualities as your current best customers. When you’re selecting lists to purchase, you can filter them by age, gender, income level and other criteria. That’s powerful! Consistent branding: Make sure your direct mail pieces, emails and landing pages have consistent branding – tagline, color scheme, iconography and call to action – so recipients will recognize your brand when each message arrives in their inbox. Extend your reach with retargeting: You can easily add code to your campaign’s landing page that will insert a cookie in the visitor’s browser, so your ads can “follow” them around the web, multiplying their exposure to your brand. Google, Facebook and Twitter offer remarketing programs that can help take your message to a larger audience! Reactivate dormant prospects: If your list contains people who have not responded to your emails in some time, sending them a direct mail piece may get them to re-engage with you. “Reactivating” people in this way usually isn’t possible with email. It’s unlikely your competitors are using this type of integrated messaging approach. According to a February 2014 study by Ascend2 and Netprospex, only 25% of B2B marketers worldwide have direct mail that is integrated with email campaigns. That means a big opportunity for you! 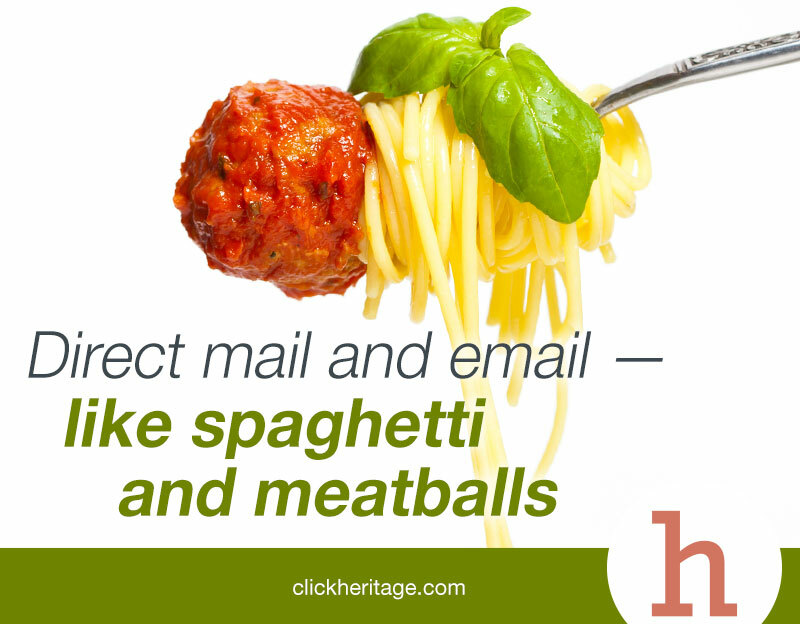 Email and direct mail are both great ways to reach people. Just remember to use the right tool for the job at hand!